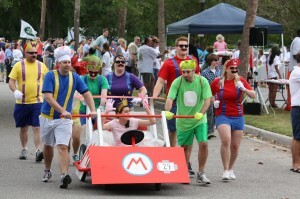 This happy event, while fun for participants and spectators alike, has a serious side. It benefits Camp Happy Days, the year round program for South Carolina’s children with cancer, whose mission is to give children diagnosed with cancer and their families hope and support by providing programs, special events emotional support and access to crisis resources. So, jump under the sheets and roll down to Mary Murray Boulevard in Hampton. A grand parade of the racing beds before the judges and spectators will take place before the heats begin. The beds will be judged on the fastest bed, slowest bed, best decorated, most outrageously decorated, the “What were you thinking?” bed, and the People’s Choice Award. The heats will involve two beds at a time racing a distance of approximately two city blocks. These heats will continue until we are down to two beds. 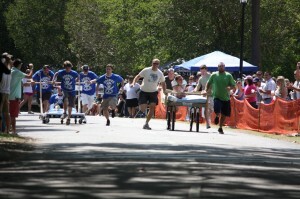 The fun continues until we have a bed race champion team who will reign for the year. Libations (a.k.a. Beer) and food will be served. Don’t miss out on the chance to expose your creative side by decorating the bed of your dreams, throwing some wheels on it, and join us on April 14th at Hampton Park! 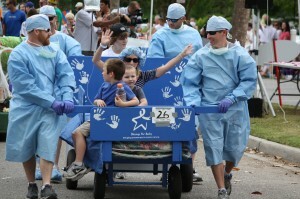 Let’s help our kids kickin’ cancer, one bed at a time!